A Danish submarine owner has been charged over the death of a Swedish female journalist who had been on board his vessel before it sank. 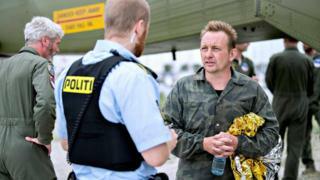 Peter Madsen, 46, denies wrongdoing, saying he had dropped the woman off in Copenhagen before the sinking. The reporter’s partner raised the alarm in the early hours of Friday when she did not return from what was supposed to be a short journey on the vessel. It was later spotted but sank on Friday morning and Mr Madsen was rescued. There was no trace of the woman, however, and police launched a search. She has still not been found. Friends have named the missing woman as Kim Wall, a 30-year-old New York-based freelance journalist who has written for the New York Times, the Guardian and Vice Magazine. The authorities have not yet been able to access the vessel, known as the Nautilus, which lies on the seabed in Koge Bay, south of Copenhagen. Salvage teams are at the site. Danish police would not comment on why charges had been brought before a body had been found, but said they would offer another update later on Saturday after Mr Madsen appears in court. Police are hunting for witnesses and camera footage to determine whether the missing woman had disembarked after setting off. Ms Wall had been writing about Mr Madsen and his submarine, which at one stage was the largest privately-made vessel of its kind.